Kimi no Na wa.’s brilliant story, setting, and music captivated its young audience, satisfying fans and critics both in Japan and overseas, which led to the overwhelming popularity of the film. This article was written by Izuka-kun and edited by Skittles and pompy of the MAL Articles Club. Interested in writing or editing featured articles? Click here! This article is the second and final part of a two-part mini-series analyzing the phenomenal success achieved by Kimi no Na wa., and will cover how Makoto Shinkai managed to produce the highest-grossing anime film of all time despite the odds. In part two, we will be looking at how Shinkai left an everlasting impression in the hearts of his audience, further cementing his movie as an all-time favorite among lots of Japanese and international viewers. SPOILER ALERT: This article has direct references to the movie that may spoil your experience when watching. Please read this article with that in mind. If you haven't, go watch the movie and come back. Please your audience, and reap the rewards. Although fanservice can serve as the equivalent of clickbait, a series without a good story will always face bad critical response. The point of a movie is for people to enjoy it, so that its positive reception gets spread through word-of-mouth. If a movie manages to please its target audience, fans will naturally advertise it to the best of their abilities. These forms of advertising may include conversations with peers, Instagram stories, and even enthusiastic tweets. One may argue that Kimi no Na wa. built a lot of hype even before its screening due to Makoto Shinkai’s established reputation, but the movie actually found major success even outside of the usual anime crowd. It was the unique and heart-warming story that contributed the most to the success of the movie. Tomoko—a graduate from the School of Commerce at Meiji University, who did the marketing for Kimi no Na wa.—said, “Of course I did a lot of promoting, but I think that the biggest factor (in [regards to] the success of the movie) is that the story itself was interesting. Although I was asked to participate from the very first meeting, it was not until I heard the plan from the director himself that I became very confident in the story. That’s why I‘ve always thought ‘I want to do this’ from the start." An aphorism in the media industry says that movies should “be the same, but different” in order to succeed. There are outliers to this rule, but this is true for most cases. Kimi no Na wa. 's target audience centered around young adults, and most were pleased with the film's heartwarming love story. Body-switching love stories provide an insightful and innovative way for two characters to develop mutual feelings for each other, but this concept isn’t something new—as Kokoro Connect had explored it before. What turned out to be a surprise to most, however, was the time difference and destruction of Itomori, which created a much-appreciated feeling of suspense, thrill, and enjoyment. Many left the cinema feeling satisfied with a story that was unique, but stayed true to the traditional rules of a romance anime. An anime should avoid being too cliché, riding the coattails of a popular trend. For example, Isekai wa Smartphone to Tomo ni took all the tropes of an isekai anime and had zero originality, causing huge backlash from anime fans. The opposite is also true: an anime cannot be too peculiar either. Seikon no Qwaser was one of those anime that tried to be different from its competition, but ended up making people question the minds of the creators. It has a low score (6.69) on MyAnimeList, and a quick look at its synopsis can tell you why. When watching Kimi no Na wa., you start to realize how adept Shinkai was in adapting his own novel. Take the body-switching, for example. With all the changes experienced during puberty, teenagers effectively wake up in new bodies each morning. Adolescence can be a very uncomfortable and confusing stage for many, and Kimi no Na wa. portrays that struggle in subtle ways. Developing breasts do, of course, interest Taki—he's a heterosexual boy, after all. But they're actually something new and surprising for Mitsuha, too. So are the feelings experienced by the teenagers in this film: the tension between respect and rebellion; the urgent need to recall the name of the one they love, but can't remember, from their uncertain dream. Taki sketches from memory a town he is sure to have never visited, and wonders, "Why does looking at it make my chest so tight?" You then start to realize that this is not the cute little switcheroo comedy you were initially lead to believe. It's deeper, more resonant, and, in some ways, embodies the most important moments of a person’s life. A fan being asked what he liked about Kimi no Na wa. Another brilliant aspect of Kimi no Na wa. was how the soundtrack complemented the scenes of the movie so well. No songs felt out of place; rather, the music enhanced the story’s narrative. During the scene at dawn where Taki forgot Mitsuha’s name after meeting her for the first time, the song “Sparkle” started playing, and it was absolutely fantastic. The melody and lyrics literally summed up Taki and Mitsuha's feelings for each other. In this scene, Mitsuha tried to save her town from the meteor, while Taki was distraught from forgetting her name. Part of the lyrics go: “Tagai no sunadokei nagame nagara kisu wo shiyou yo sayonara kara ichiban tooi basho de machiawase yo,” which means, “Let's kiss as we watch each other's hourglasses and let's meet up at the place farthest from goodbye.” The hourglass refers to the short time they had with each other, and how they should’ve spent their remaining time together, as opposed to leaving (sayonara). Such little details in the music score, harmonious melodies, and sounds that appeal to most young teens made the anime much more memorable. 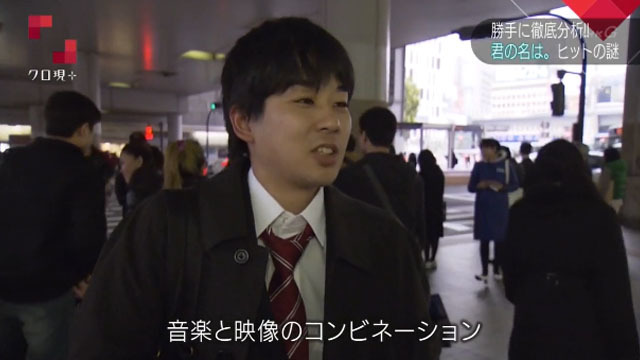 One particular fan was interviewed and asked, “What is most memorable about the movie?” His response was, “The combination of music and video.” The reason the music was so perfectly made was mostly due to the freedom given to Radwimps. When Shinkai contacted Radwimps to make the music score, he told Yojiro Noda to compose the music “in a way that the music [would] supplement the dialogue or monologue of characters.” One misconception people have is that, by employing big names, the music will automatically make the movie receive positive feedback. While it’s true that big names are able to draw in a lot of viewers most of the time (ex. Daoko in Uchiage Hanabi), popularity doesn't actually make a film successful. Radwimps was previously not a huge name in Japan, and hardly anyone overseas had ever heard of them, but look at them now. Radwimps didn’t just make Kimi no Na wa. more popular; Kimi no Na wa. made them more popular, as well. 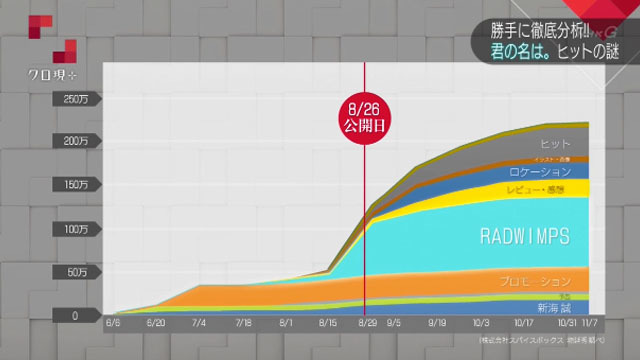 Radwimps’ popularity skyrocketed after just 2 weeks of their song’s release, even before the movie had actually premiered. One of the most crucial, but underappreciated, contributions to Kimi no Na wa.’s success was its setting. While the town of Itomori—one of the film's settings—is fictional, the film drew inspirations from real-life locations that were backdrops for the town. Such locations include the city of Hida, in Gifu Prefecture, and its library, Hida City Library. The most famous real-life location in the film is the staircase at Suga Shrine, in Yotsuya. Many flocked to the location and posted images of them being there on social media, advertising the movie in the process. 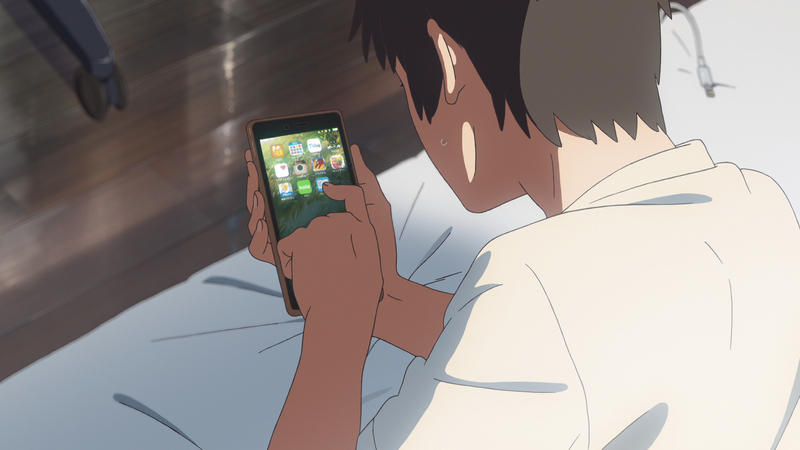 Moreover, Mitsuha and Taki keep journals about their switched life on an application similar to LINE (a popular chat application used in Japan). The setting appealed to young people in their teens and twenties, captivating them. Social media went crazy as these young adults kept spreading the word about the movie. 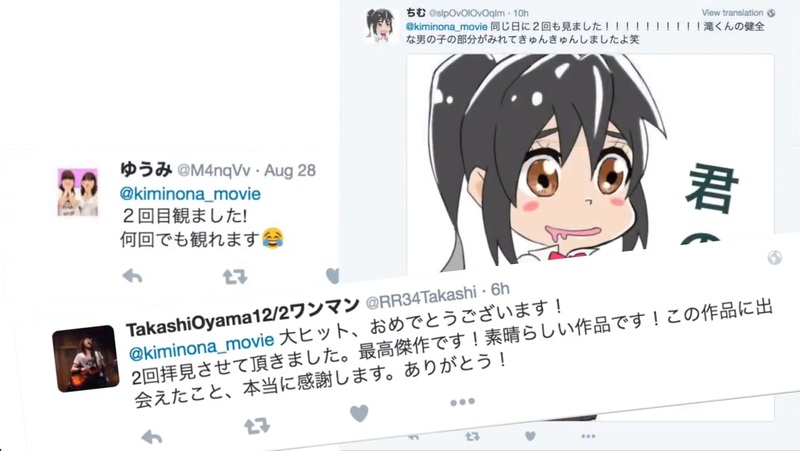 People who usually don’t go to the movies or don’t usually watch anime were caught by surprise at the hype. Seeing that the hype was justified, they, in turn, took part in spreading the news. Taki using an application very similar to LINE. Another reason why the story was so touching, especially for Japanese viewers, was because it reminded some viewers of the 2011 Fukushima Daiichi nuclear disaster. What seemed at first like a glistening, teen rom-com turns into a dark, affective, very different sort of story—a harrowing survival tale that blends elements of Japan's recent real-life nuclear reactor meltdown. This made the story much more personal and deeply connected towards the Japanese audience. To no one’s surprise, Kimi no Na wa. blew up very quickly in Japan right after its release. The Fields Research Institute of Shibuya conducted a survey of 11,646 Japanese people aged six to 69, asking if they'd seen the movie and whether they had liked it. Unsurprisingly, not many six or 69-year-olds watched the movie in theaters. Many teenagers, however, had watched the movie. 36% of male and 31% of female high school students watched Kimi no Na wa., and most of them loved it. As expected, these teenagers were also hugely responsible in spreading the word about the movie. The best advertising always involves the fans directly, so anime companies should always tailor their production towards pleasing their target crowd. Twitter blew up when Kimi no Na wa. aired. In conclusion, animation companies must evenly distribute their budget to all aspects of their film, rather than focusing on only one. They should also try to reduce unnecessary costs that contribute little to nothing towards the success of their film. While doing this, they must also stay true to their audience, pleasing them with what they want, so their films can succeed in drawing bigger crowds. Kimi no Na wa. might not be perfect, but that is not to say that what Makoto Shinkai did was not a spectacle to behold. His movie is probably one of the best success stories in the anime industry, something that other creators and studios should try to emulate. If the whole industry grasps a firm understanding on the winning formula Shinkai used, we might soon see the second golden age of anime. Taki and Mitsuha thought they were dreaming, and after about the first 30 minutes of Shinkai's shimmering film, we all felt like we were, too. You think you know anime movies? Have you seen all 30 of these movies on our best anime movie list? Our writer sets themselves a only-one-movie-per-director rule and comes up with 30 movies every anime fan must see. Music in anime can be a blessing or a curse. When done correctly, it can leave an everlasting impression on the audience. Music is merely one element of many, but it is a critical component that defines the emotional impact of an anime. Makoto Shinkai managed to produce the highest-grossing anime film of all time despite the number of challenges that came his way, while also disproving several common misconceptions about producing anime. Here's a brief look at 12 anime like Toradora! each with their own tale of unrequited love, friendship, school, or family that range from the dramatic to just outright funny. When Dubbing Kimi no Na wa, "Sleep is Basically Optional"
Voice actors/directors Stephanie Sheh and Michael Sinterniklaas talk about what it was like to dub Kimi no Na wa, the world's highest-grossing anime movie of all time. Anime: Kimi no Na wa.